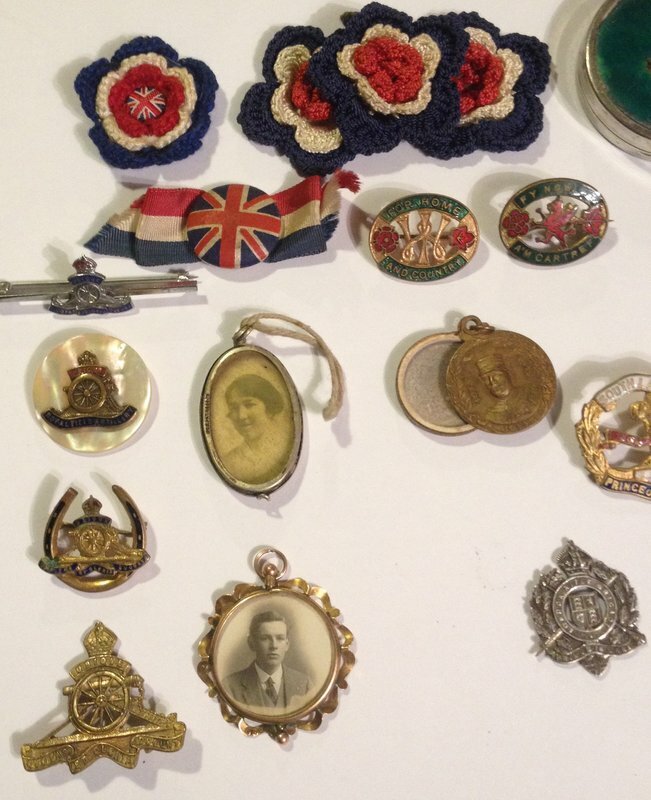 Interests:Late 19th and 20th C. Military History. 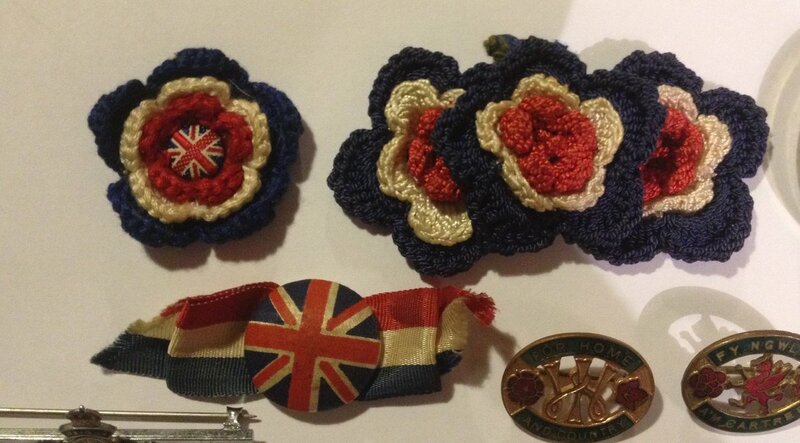 G.S Button jewellery, the bracelet contains a picture of a £1 note with the wording "Souvenier of the Great War, Aug. 4th. 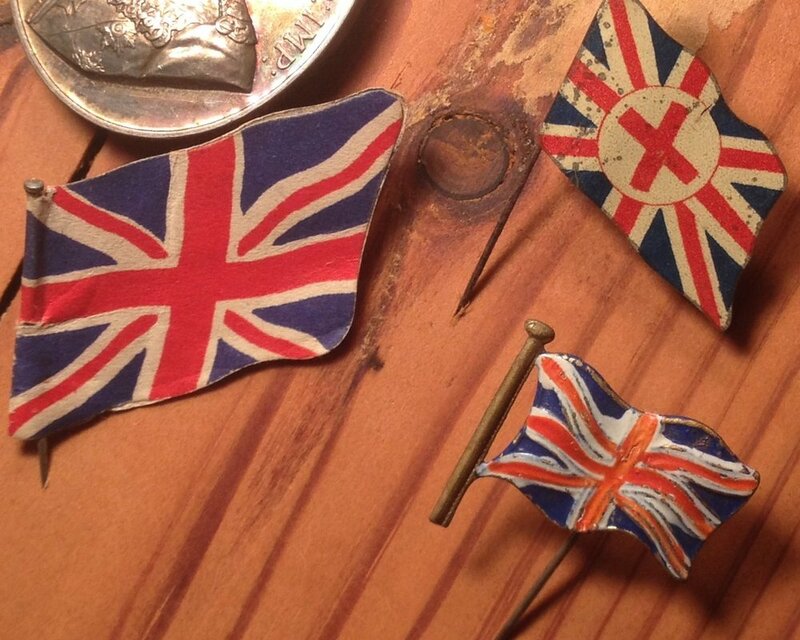 1914" at centre, and pictures of Baden Powell, Sir John French, William Pulteney Pulteney, Admiral Jellico and two Sheltie dogs; - Heroes all. 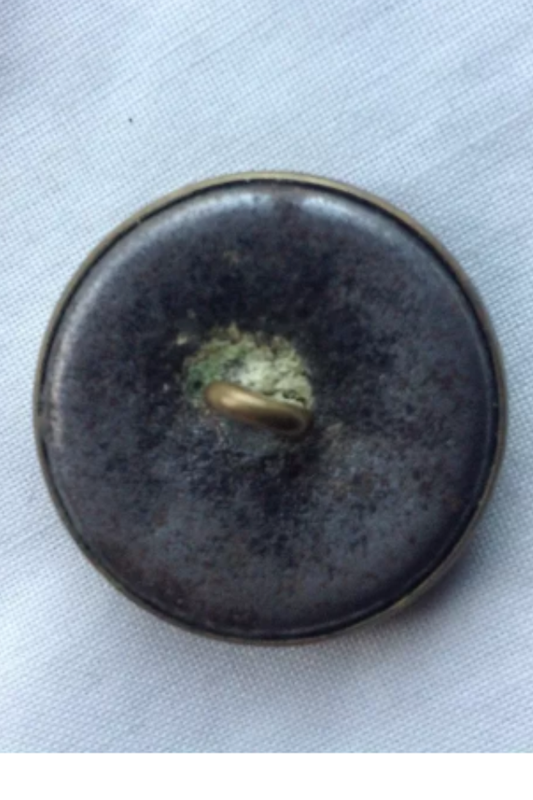 The button lockets were in a large box of G.S buttons, the seller was unaware they were any different. 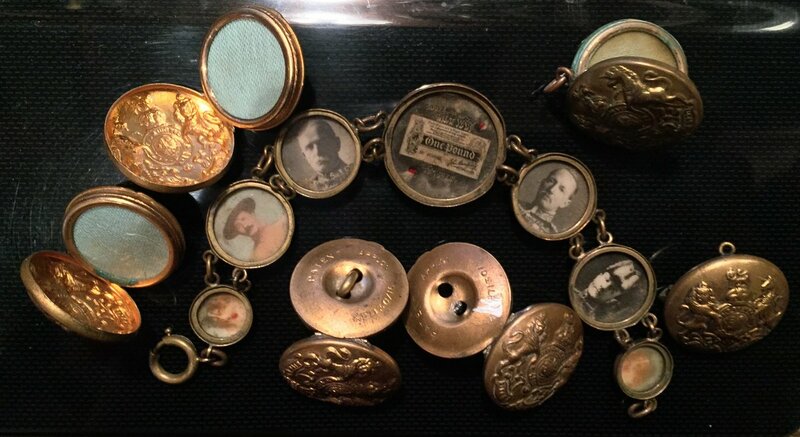 I bought G.S buttons by 8 different makers along with the lockets, these were made by " Patent Applon No. 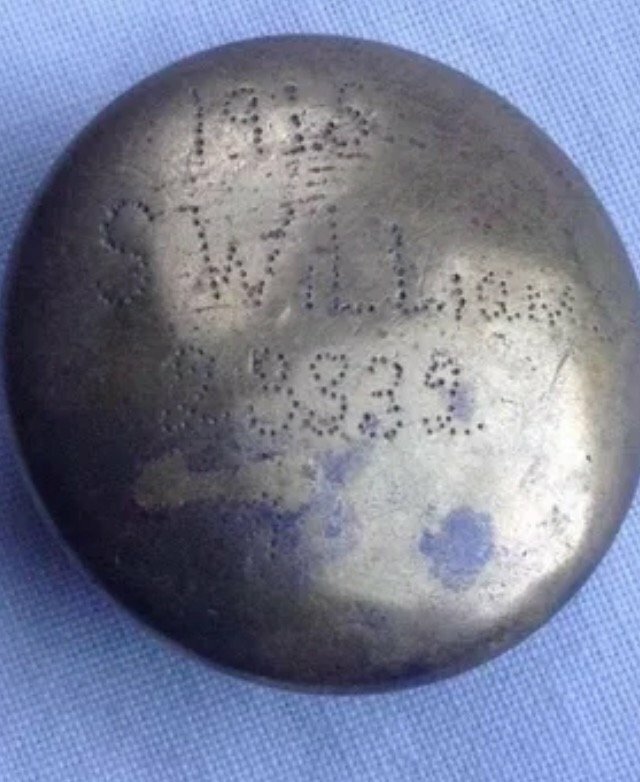 7130/15" ( one by the same maker was offered for sale on eBay as " WW1 Special forces, escape button"). 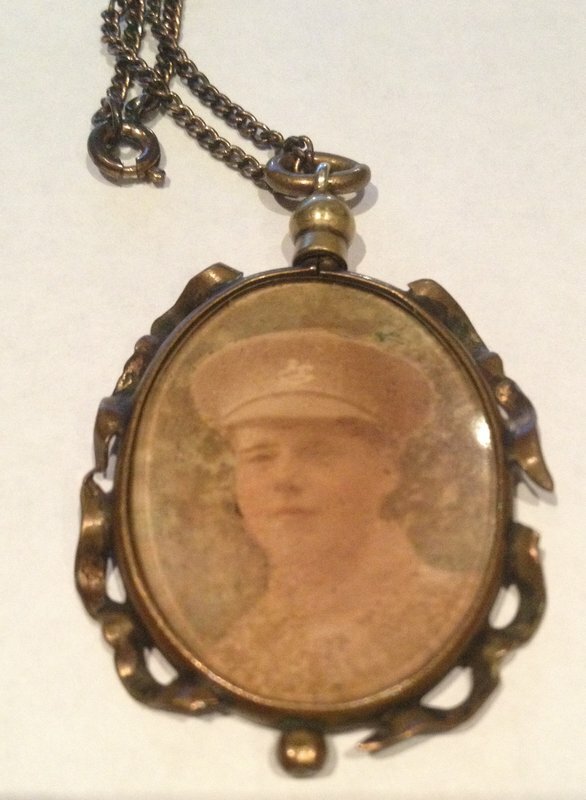 The brooch/pendant is made from a button by H.Robert & Co. London. 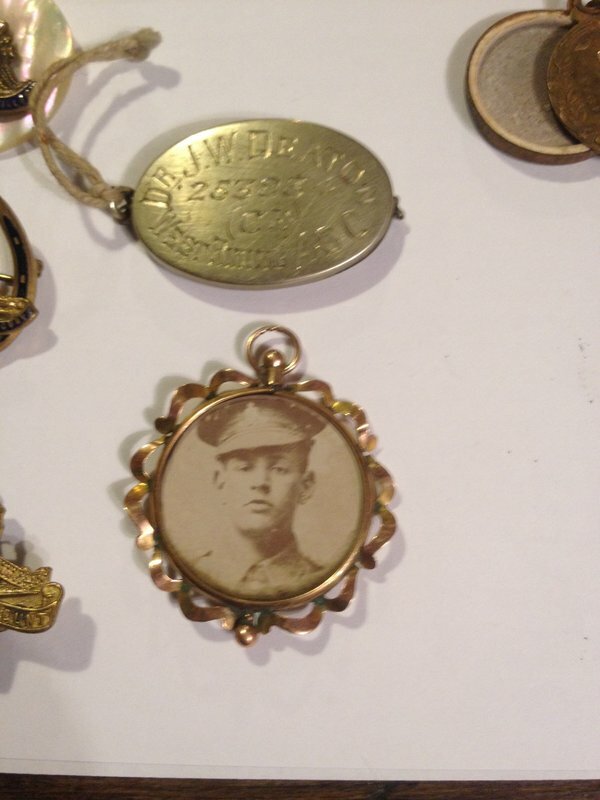 The pendant is unmarked. All have the same insert. Thanks for sharing Buffnutt. Very nice. 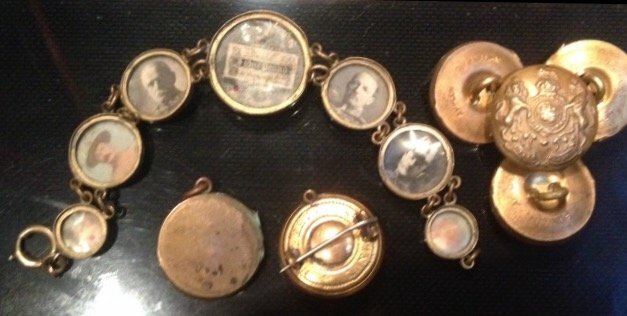 eBay may be your friend for sweethearts similar to those worn by your G.G.Aunt..
My pictures show the two sides of the same rose gold locket, one side in civies, the other has the same man in R.A uniform. It came from my favourite junk shop. 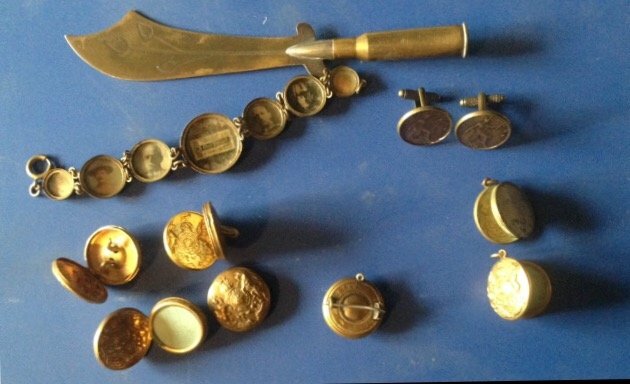 My offer was declined as too low at first, until I pointed out anyone else would likely ditch the photos, either replacing them, or weighing the locket in as scrap. My wife collects Sweetheart badges, mainly Aussie and Filigree one especially, but I like these two. 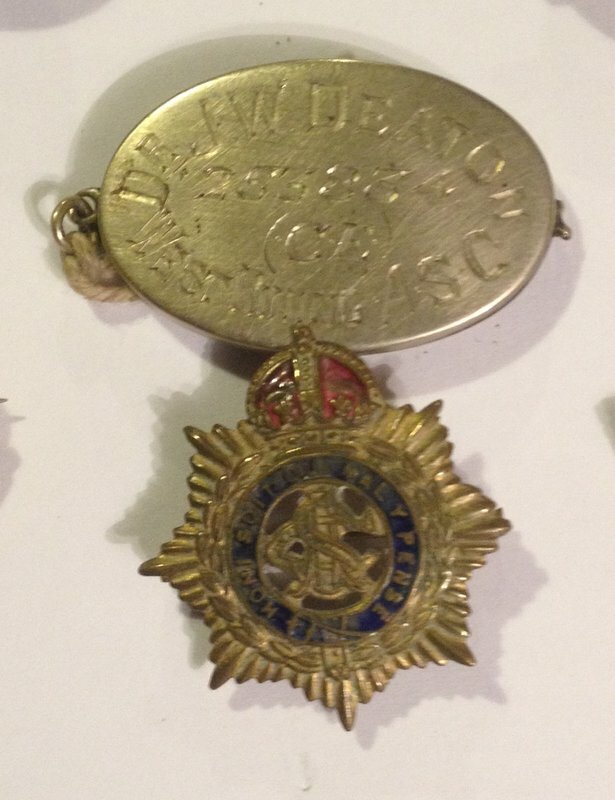 They are standard Officers pips modified for badges. 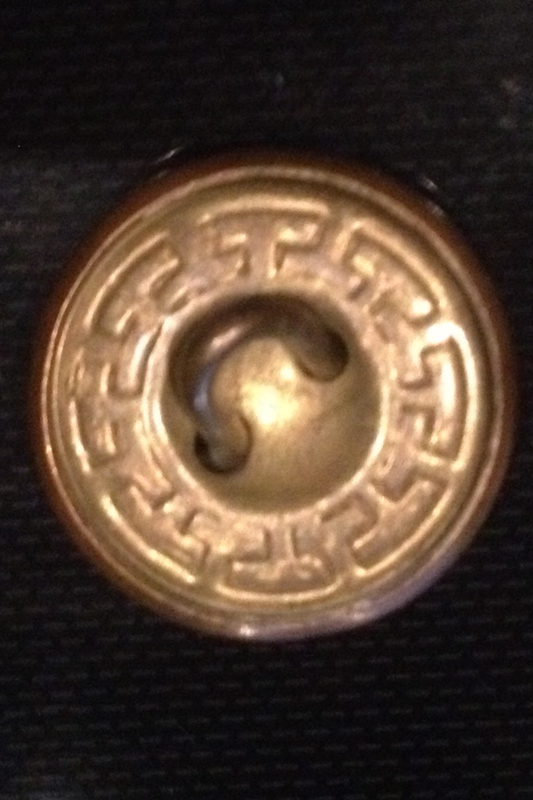 I have a brooch that I presume is a sweetheart brooch, perhaps members will be able to confirm or not. 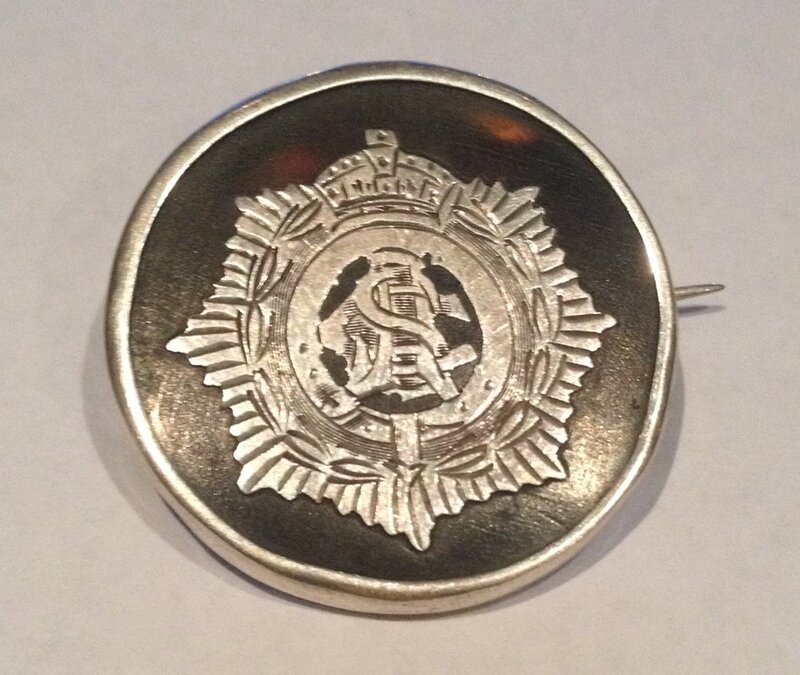 It is an RFC brooch set in silver and hallmarked S&Co for Birmingham 1916 and is 25mm in diameter. The wings are set into the background so I presume it will be plastic [unless they were able to let silver into tortoise shell]. 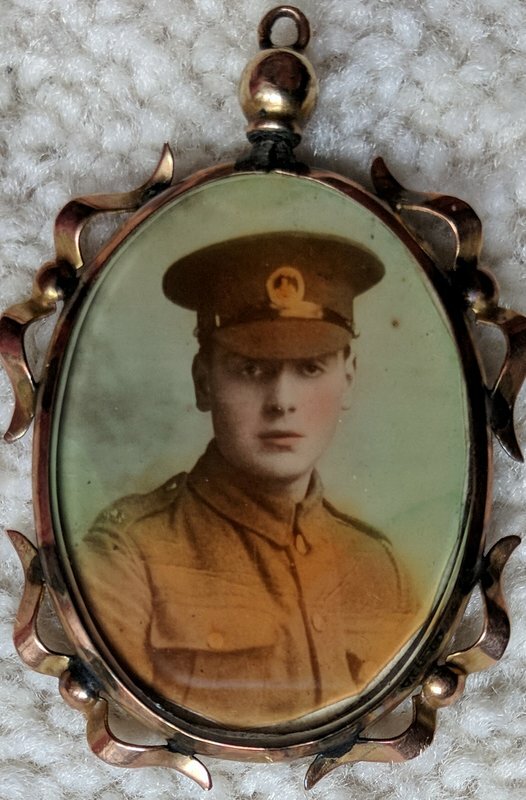 The other one is Leeds Rifles, is this a sweetheart brooch? I can't find one on G--gle. 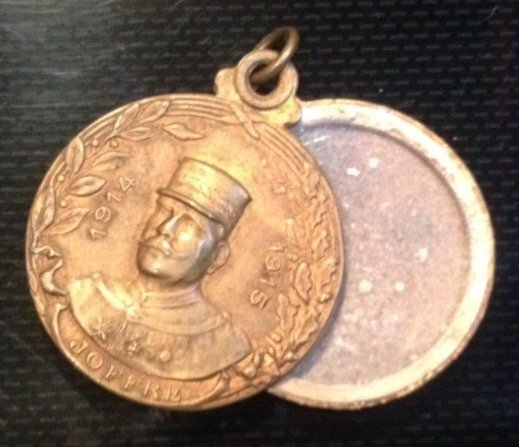 It is blackened brass with South Africa 1900-02 cast into it and is 40mm sq . 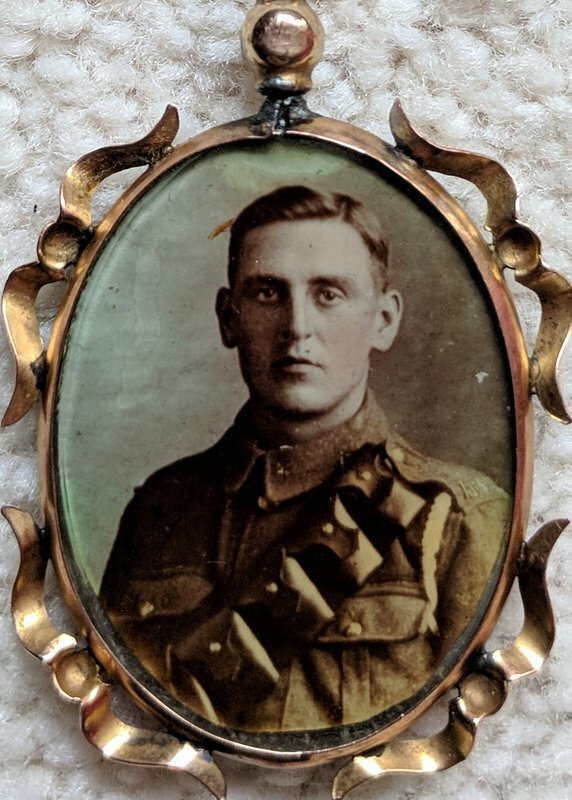 My uncle Reg was in 8th Battalion West Yorkshire Regiment [Leeds Rifles] but his cap badge was not like this, can someone explain why this is please. 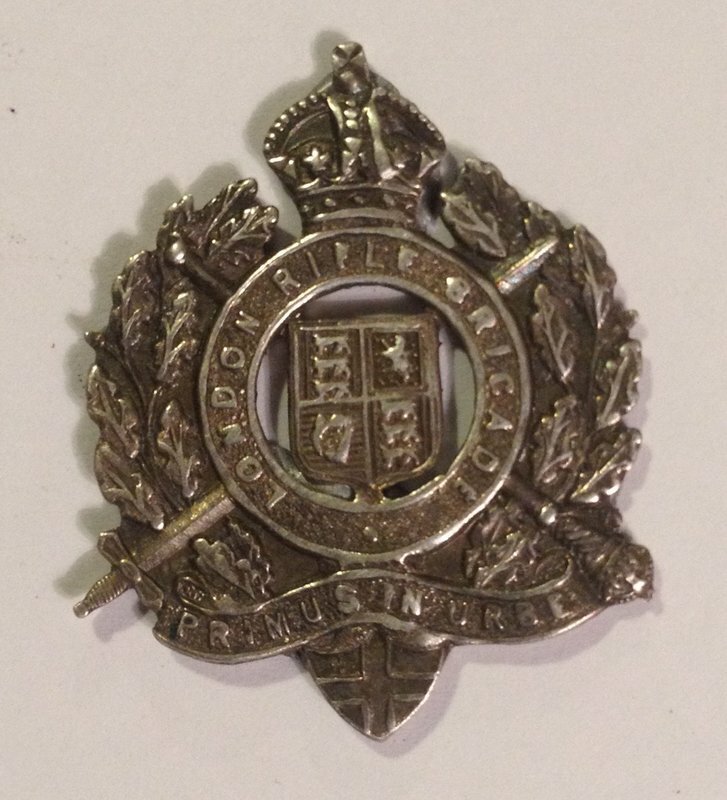 The silver RFC sweetheart is very nice; not sure about the Leeds Rifles badge, are there any obvious signs the laurel wreath surround has been removed or was it made as a simple cross? 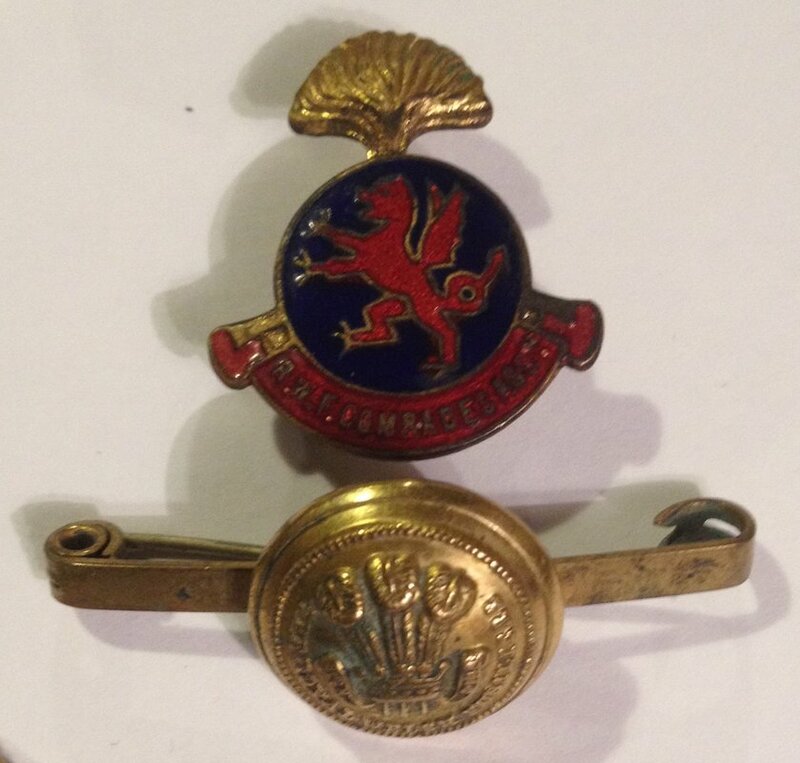 There are no signs that it has been removed from a larger badge, also I can't find another like it in as much as it's the only one I I've seen with the South Africa reference in the uppermost part and with the 4 lions passant pierced to reveal legs. Notice also the broken fastening clip which I assume was identical to the one attached. I bought this a while back, but have forgotten or lost any details about it that the seller may have had. 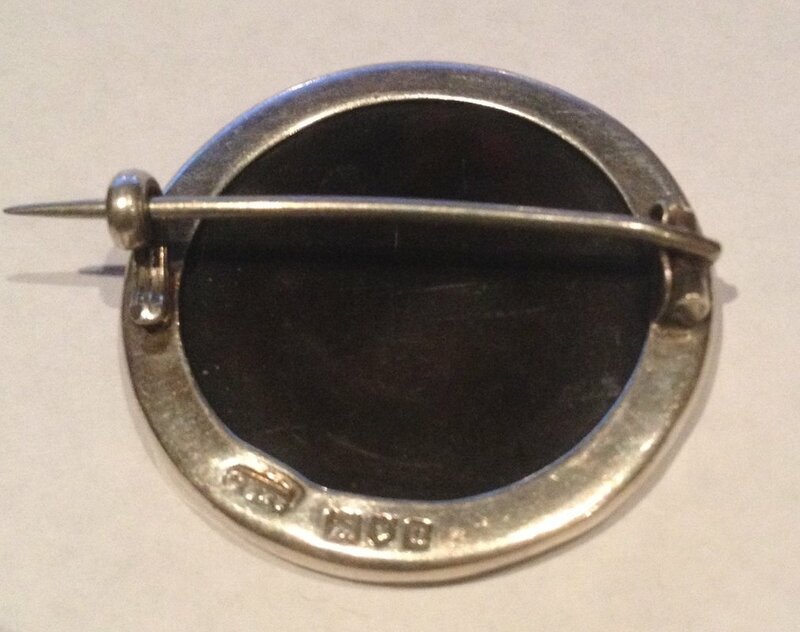 It has a plain back of a piece with the rim, and a pin soldered on. 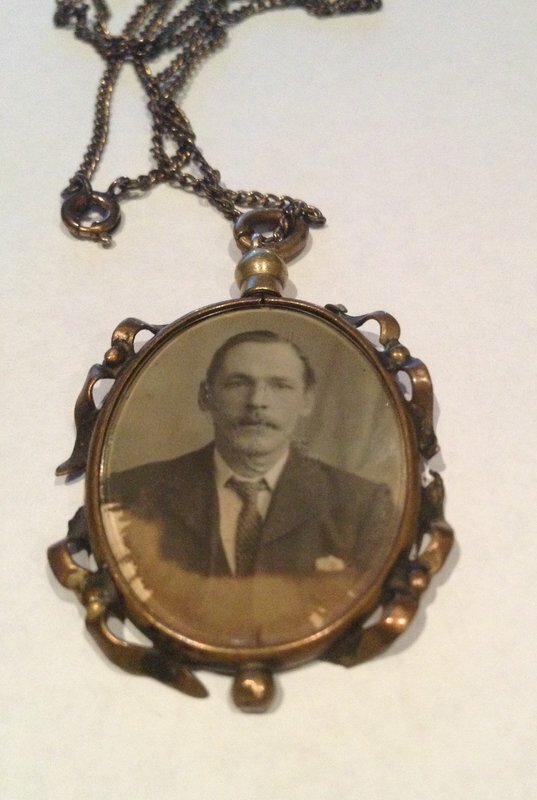 I have thought lockets made from buttons pretty rare, although I may be wrong. I have a couple which I found and bought some years ago, but I have never seen another since. I've seen a few at antique fairs and on eBay, usually quite expensive. I'd be interested to see the couple you have. Thanks; it may well have been made as a sweetheart. 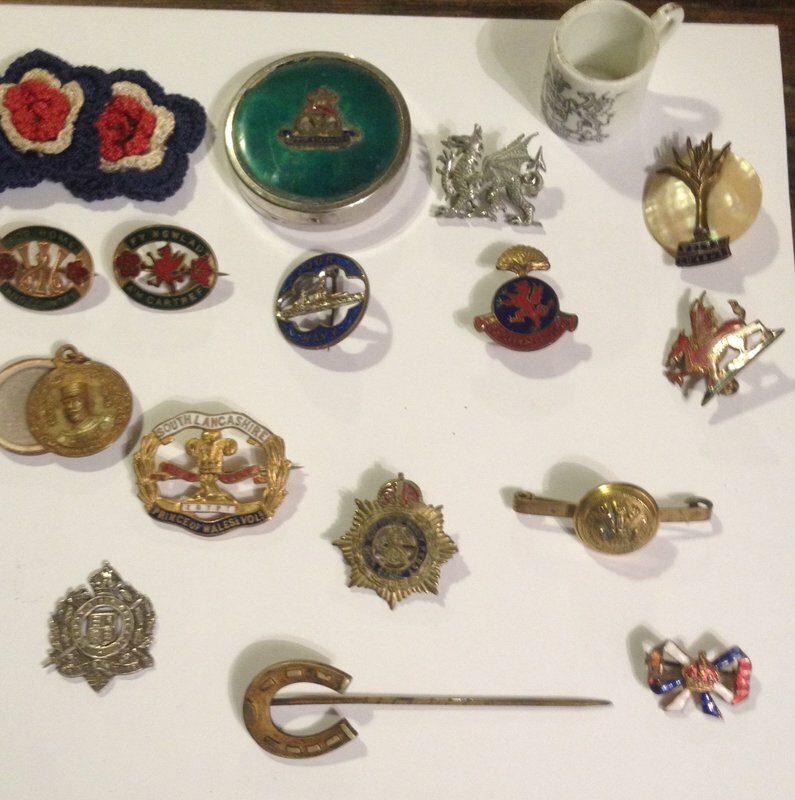 You could try posting it in the "uniforms, cap badges and insignia" thread. Badge experts are more likely to see it there. I have a brooch that I presume is a sweetheart brooch, perhaps members will be able to confirm or not. [unless they were able to let silver into tortoise shell]. . I have one very similar that I overlooked when taking photos. 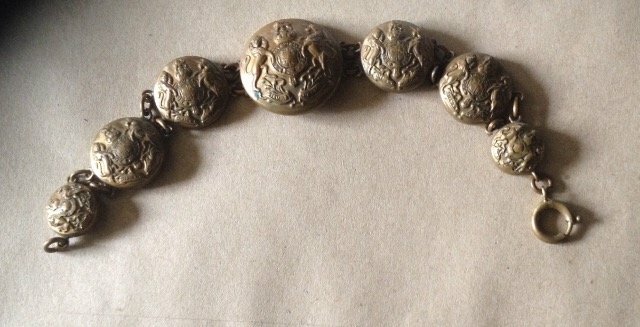 New find today; King's Liverpool and father? This is in Kipling & King as KK 1713. The more familiar RB-style version with the wreath surrounding the Maltese cross is KK 1712. 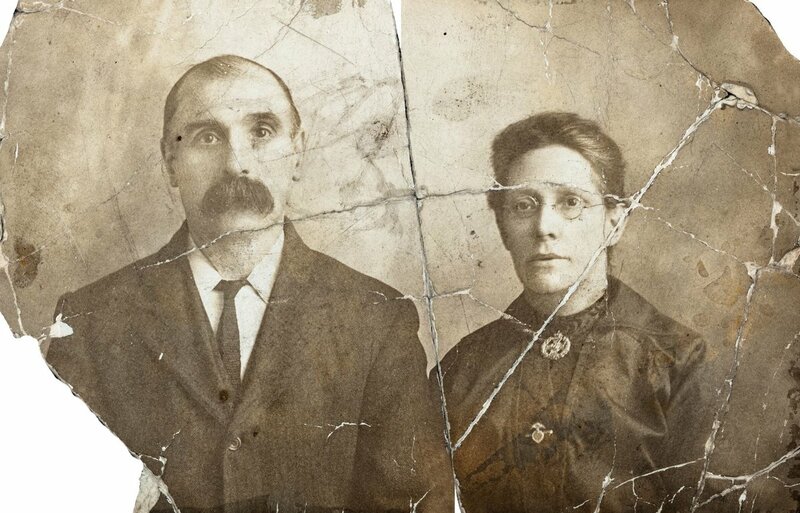 Both are described as being 7th and 8th Battalions, Prince of Wales's Own (West Yorkshire Regiment) (Leeds Rifles) 1908-1921. I can give no explanation as to the differences though. secondly I have absolutely no idea how to put pictures up on the forum. Technology and I do not have a very friendly relationship and I have given up every aspect of it I do not need. i'v just bought a new car, I need a co pilot to help get the radio on and already the car' computer system seems to know more about me than I know about myself! Thanks for the lookup Mark. David, I know the feeling; fortunately I can bother my lads when I get stuck! I have decided the only option is to kidnap a bright tech savvy yoof. Lock him in a under- stair cupboard with a games machines et al - never forget Al. Feed him on omelettes, which I shall slide under the door, and let him out when I become technologically challenged. I.e. every day! 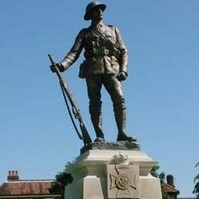 It looks like he transferred to the West Yorkshire Regiment, perhaps after he was commissioned. Do you have a name for him? 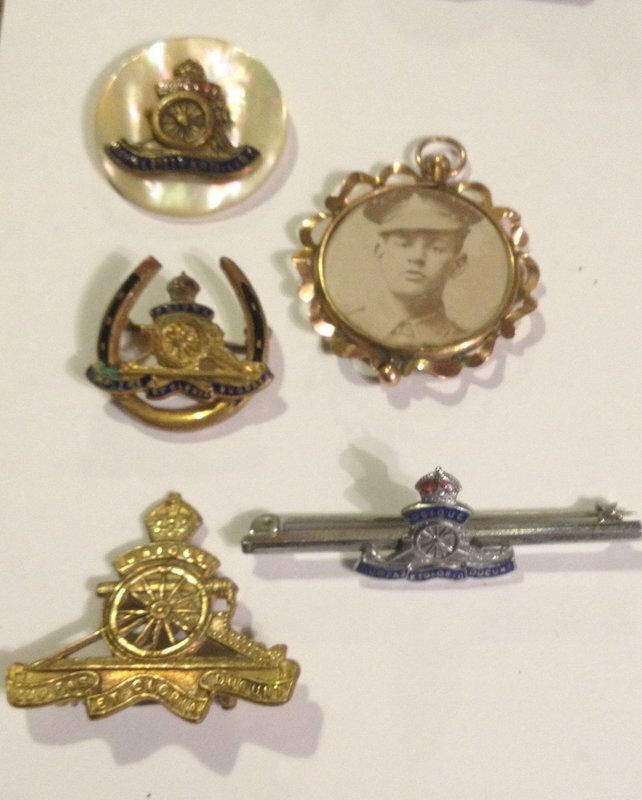 I agree the cap badge and collar dogs look like the standard West Yorkshires to me - i.e. not the Leeds Rifles. 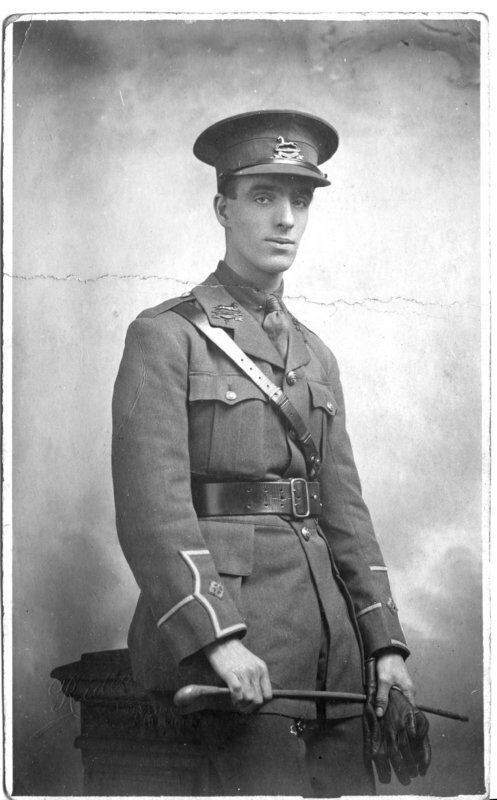 The Leeds Rifles were 7th and 8th Battalions, Prince of Wales's Own (West Yorkshire Regiment), so he would only be changing battalions within the same regiment. 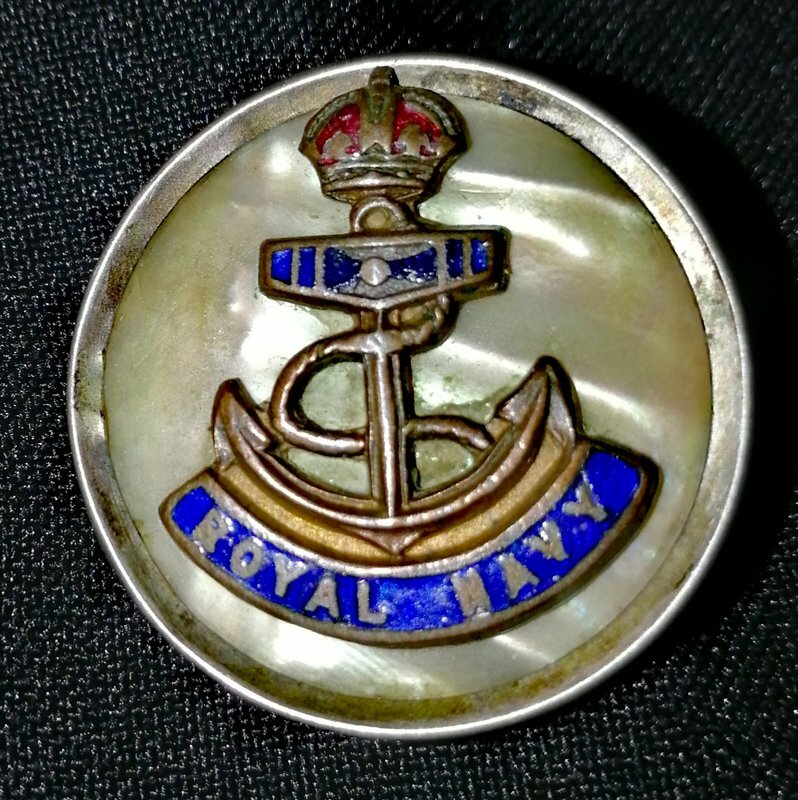 This badge is the officers version of the 7th/8th (Leeds Rifles) Bns PWO West Yorkshire Regt. cap badge This badge was worn as the officer's cap badge only, as the normal West Yorks cap badge (galloping horse over West Yorkshire) was worn as collar badges by all officers of the West Yorks.Regt., regardless of their battalion. 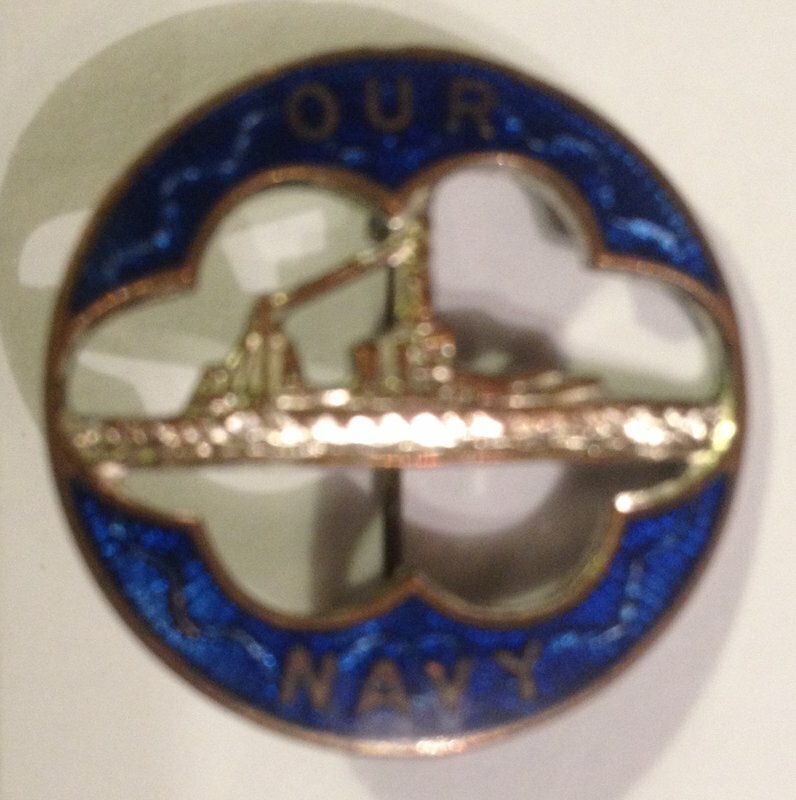 The badge was made in silver, white-metal and bronze.